” Google+,” (Google Plus) which is Google’s second attempt at harnessing social media was getting all the buzz this week, so it was a pleasant surprise to find that Google launched a search tool that will be useful for citizen journalists and place bloggers, without any buzz at all. WDLY.com is the new site, and it stands for What do you love? I already love WDLY. The site starts with a plain looking search engine page, with the question “What do you love” a “from Google” note, and a search box. Type in a search term or terms, and WDYL returns a grid that holds a series of sub-searches on your term. I discovered WDLY.com via smartphone, traveling on the subway. 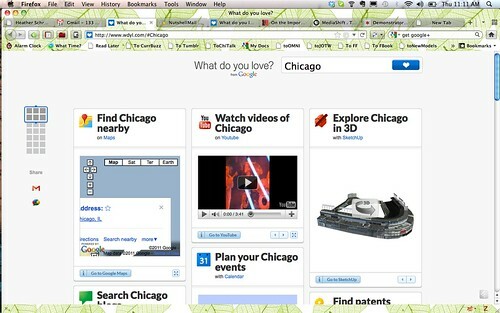 When I found it, I typed “Chicago” into the search box, because that is a subject I know about. WDLY.com takes your search term and runs it through a very useful collection of what I would call “sub-searches” that it presents on one page. The design is flexible, so it scales to be readable on any size screen. It pays to treat any new tool like any kind of information, and be a journalist. Vet it before you use or recommend it. That means, look you for mistakes, errors, and omissions and verify that it works. When you can explain it to yourself, you are ready to use that tool as citizen journalist. The searches were fast, and what you expect from these tools. For a citizen journalist, the news tool is a quick way to monitor what’s going on and see if there is breaking news. It is not the kind of exhaustive, custom search you need to do when you are doing in-depth reporting. The 3-D was more useful than I thought, because Chicago is a center of architecture, and most of our major skyscrapers have been rendered in 3-D. I’d pull those in if there was an emergency or perhaps to illustrate a zoning variance story. If you are writing about phyical objects, be sure to try the 3-D and see if it has images that could illustrate your story. The trends search is more useful if you narrow your search term, for example, I could search for “Chicago mayor,” and see that topic was trending up as the last mayoral election was held. I think “Trends” searches can add to a story, but it is easy to forget to do one when you are using Google’s regular search page. An important thing to remember, is that if you are signed into Google, when you do a WDYL search, it will customize some of the searches based on your login. So the “Make a Photo Album” brings back only your photos if you are logged into Google. If you aren’t logged in, then you will see all the public albums that meet your search criteria. This could prove confusing if you work with shared computers, or switch between Google accounts. For some of the offerings like Google Voice, or Calendar, you will have to login or sign up for an account in order to use the feature. The pros of WDYL are its speed, ease of use, it scales to any device, and you can customize it to work with any Google login. Because the sub-searches are in boxes in a grid view, the sidebar can feature a navigation grid that makes scrolling up and down a bit more precise and easier to accomplish. Cartoonist Scott McCloud’s pioneering work on visualizing images on the web, used a sidebar navigation grid that was way more elegant than WDYL’s, but I’ve always found that style of navigation to be intuitive and user-friendly. The cons of WDYO are that it is Google-centric, and that because it customizes to your Google login, it could confuse a user. While Google is generally “good,” it should give all of us pause to trust any single site or company as our information source. For journalists, this is very important to remember. WDYL.com isn’t going to beat blekko.com for elegant, scholarly, and specific searching, but it is easier to use than blekko, and its multiple search dimensions give you a quick and easy overview of your search domain. Barbara K. Iverson, PhD. Associate Professor, Journalism Columbia College Chicago Barbara K. Iverson is co-founder and web guru for Chicagotalks.org, a community and citizen news website. She teaches Online Journalism at Columbia College Chicago, as well as doing workshops on social networking, social media, citizen journalism, and blogging when she isn't online or writing. "DrBarb" joined Twitter when it was only a few months old, and she was an early proponent of Twitter as a tool for journalists. A "midlife" journalist, Barbara was an interactive multimedia producer, before working in journalism. Iverson was inspired by her experience at Ohmynews Citizen Journalism Forum in Seoul, S. Korea in 2005. She has been a contributor to Poynter's E-Media Tidbits, VP for Technology for Association of Women Journalists(AWJ), and a mmeber of Media Bloggers Association (MBA,) and the Online News Association (ONA.) Barbara is excited to a board member of Chicago Instructional Technology Foundation to foster educational innovation through smart use of technology.